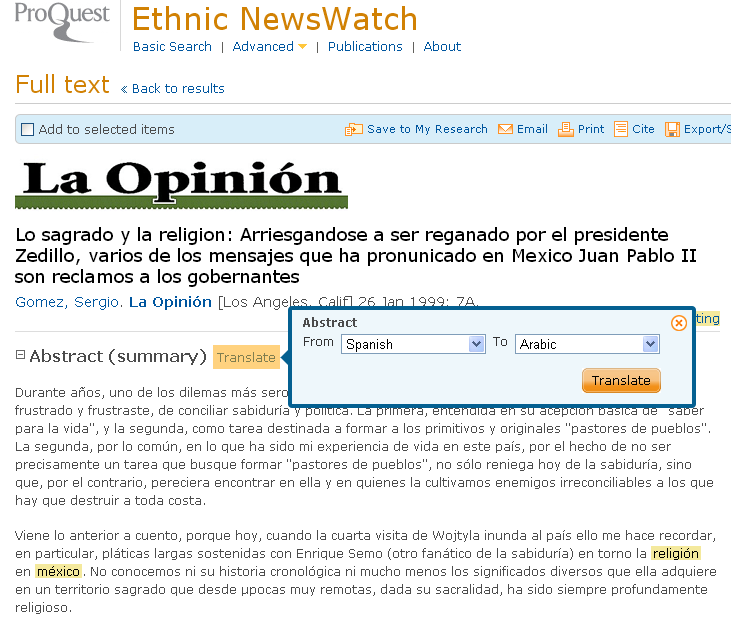 Ethnic NewsWatch (ENW) features newspapers, magazines, and journals of the ethnic and minority press, providing researchers access to essential, often overlooked perspectives. With titles dating from 1990, ENW presents a comprehensive, full-text collection of more than 1.8 million articles from more than 315 publications offering both national and regional coverage. While the content may mirror mainstream media coverage, the viewpoints are decidedly unique. Ethnic NewsWatch delivers hundreds of important ethnic press publications. The voices of the Asian-American, Jewish, African-American, Native-American, Arab-American, Eastern-European, and multi-ethnic communities can be heard. Titles include Kurdish Life, Asian Week, Jewish Exponent, Seminole Tribune, Appalachian Heritage, The Boston Irish Reporter, Chinese America, The Filipino Express, Hmong Times, and many more. A majority of this content is exclusive to ENW and not available in any other database. Of the more than 1.8 million articles contained in the collection, nearly a quarter are presented in Spanish, making ENW an unmatched bilingual diversity database. Dozens of major Latino publications are featured, including El Nuevo Herald, and El Andar. For a change of view try Ethnic NewsWatch today! You can translate any article into a variety of languages, too.